I’ve played through all the episodes so far of Batman: The Telltale Series video game and thought I’d figured out who the game’s big bad was. The villain using chemicals to manipulate people into acting out their repressed impulses? Had to be Scarecrow, right? Wrong. An all-new character is pulling the strings, revealed in a scene that threw me for a loop. “New World Order,” the third installment of Telltale’s Batman episodic video game, opens with Bruce Wayne paying a visit to after a mayoral debate where incumbent opponent Hamilton Hill was killed by Oswald Cobblepot/the Penguin and the terrorist Children of Arkham This game’s played fast and loose with established pillars of Batman lore but, early on in this episode, we get the first signs of the buried psychological trauma that will likely turn Harvey into Two-Face. Harvey’s become mayor by default and his awkward conversation with Bruce shows the stress of recent events has brought him to the brink. It’s a poignant scene that makes Harvey feel desperate and alone. I’ve enjoyed how this Batman game has been sketching out its cast of characters. Even the nastiest bad guys, like crime boss Carmine Falcone and Hamilton Hill, have felt multidimensional and semi-sympathetic. Their appeals for Bruce to follow in his father’s criminal footsteps alongside of them come across as a sort of surrogate parenting. They feel more human, as does not-quite-nemesis Catwoman. In her civilian identity, Selina Kyle is dating Harvey Dent but also winds up hitting it off with Bruce Wayne, too. She’s learned about his double life and the two have an unexpected team up that foils the Children of Arkham’s plot to poison thousands of Gothamites. Bruce gets critically wounded in the scuffle and Selina brings him back to her apartment so he can recuperate. In the talk that follows, Selina demonstrates poignant self-awareness of her own behaviors and the attraction between her and Bruce flares up. When Harvey shows up unannounced, his suspicion and feelings of betrayal bring out a more volatile side of him. Harvey’s desperation is akin to what Bruce felt after learning the truth about his father. The major revelation in episode two showed Thomas Wayne to have been a manipulative alpha-criminal who drugged people to get what they want. While it’s a big break from mainline Bat-canon, it’s relatively still a safe one. Thomas Wayne is dead and his sins are in the past; players won’t get a chance to see Batman’s daddy be a twisted puppy using power and influence to his own ends. The subversion is fixed to a point in times past and that limits its power to shock. ...followed by a terse chat with Vicki Vale, who’s been doggedly covering all the upheaval rocking Gotham to its core. Upheaval that she’s the source of. ...but it also works as clever foreshadowing once you know where things are headed. 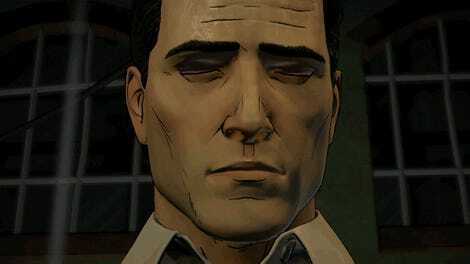 Thomas Wayne re-imagining aside, I’d wondered how far away from generally accepted canon Telltale would stray. This take has re-aligned relationships and tweaked personalities but, up until this episode, most of the characters still felt familiar. That familiarity got exploded even further this week and I’m looking forward to more radical reconfiguration in the episodes yet to come.